This week, we've added director Christopher Nolan's The Dark Knight Rises to our Long Range Forecast. The highly anticipated finale opens in IMAX and 2D theaters beginning at midnight Friday, July 20. - The sequel to (at one time) the second highest-grossing film of all-time. Just as sequels pay for the sins of their predecessors, they also reap the benefits of that which precedes them. 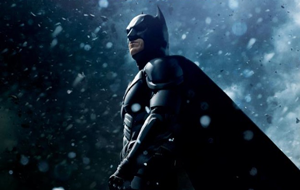 - Prior to The Dark Knight, Batman had broken the opening weekend record three times (Batman, Batman Returns, and Batman Forever) -- twice without featuring The Joker. - Nolan is more a part of the "draw" than he was four years ago. The Dark Knight and Inception have cemented his status as a name that people in a general audience recognize and are interested in. - Despite the fanboy appeal of three of his last four films, every film ever directed by Nolan has at least tripled its opening weekend gross through superb word of mouth. In other words, front-loading has yet to be an issue for his work. - Marvel's The Avengers ticket sales without the 3D bump would equate to a roughly $180-185 million opening. With a mid-summer opening and undoubtedly bigger midnight sales, Rises may not break that film's dollar record (due to lacking any 3D price advantage) but could match or exceed it in actual ticket sales. - All footage screened so far has been very positively received. The fact that the film received its rating over three months in advance indicates that the powers-that-be are very happy with the final result. - With nearly an hour of IMAX footage (and playing in four times as many of those venues as The Dark Knight did), a long and healthy run in the format is in store. - Warner Bros. is successfully painting this as the end to a trilogy. As Fox did with the end of the Star Wars prequels and WB itself with Harry Potter last year, selling this as the conclusion to a story will be effective in the absence of a marketing powerhouse like that of The Joker. - Trilogy-capper comparisons: the grosses of Revenge of the Sith and The Lord of the Rings: The Return of the King adjust to $470 million and $487 million, respectively, when considering inflation -- and neither film had an IMAX boost. - Zero competition. *This* is the competition. - One of Nolan's fortes up to this point is concluding a story with a crowd-pleasing final act. If this is applied this to an entire film as part of a bigger arc, it could create yet another "water cooler" discussion topic familiar to most of his films. - Hype and the curse of the superhero three-quel. It has undone plenty of films in the past (Superman III, Batman Forever, X-Men: The Last Stand, Spider-Man 3) and the fan base will be particularly critical of decisions made in this final film. - Opening closer to the opening of the Olympics than The Dark Knight did in 2008 could be a factor that leads to more front-loading for Rises when compared to that film. - It is exceedingly difficult to out-perform a predecessor that sold more tickets than all but a handful of films in the last fifteen years. - The tragic circumstances surrounding Heath Ledger's death brought a lot of extra buzz to the predecessor. Rises won't have that, so how Nolan chooses to end his trilogy will be even more important for the box office performance after opening weekend. Notable changes in our forecast this week include minor changes on Snow White and the Huntsman, Prometheus, Brave, Abraham Lincoln: Vampire Hunter, Ted, and Madea's Witness Protection. In addition, G.I. Joe: Retaliation has been removed from our forecast due to its release date change to March 29, 2013.